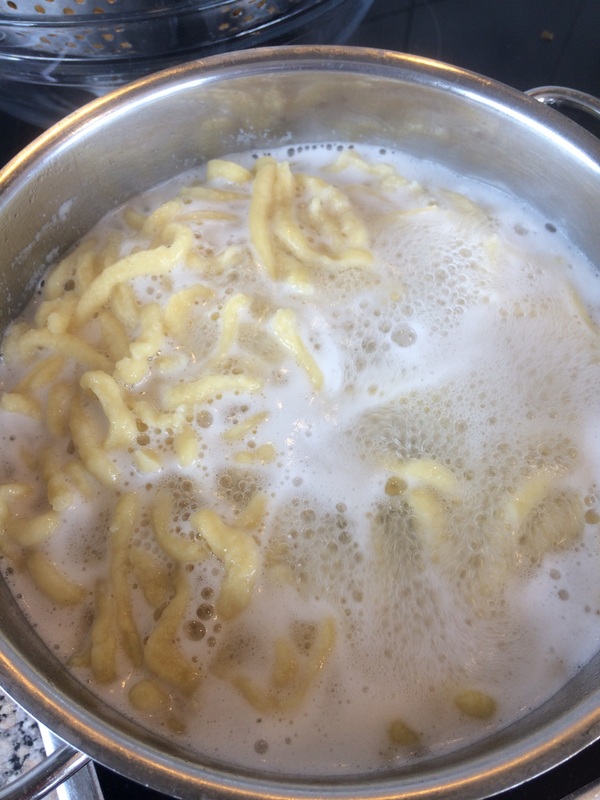 I've made spaetzle a few times now but every time I struggle with it ending up a bit wet/soggy, I try to drain it the best I can but it holds a lot of water still. I do sometimes end up cooking it longer then usual recommended 2/3 minutes because I worry it will stay too raw. am I doing something wrong, or could I do something to stop that its always so soggy/wet? I use a spaetzle maker (the sliding bucket grater type). I see that recipe says the pot of water should only be simmering. I just read when researching that the water should be at a rolling boil for it not to be soggy, maybe this is what I need to do? I'm sure I tried that at some point though. Or that I overcooked the spaetzle until now and that makes it soggy? Im not sure. Two eggs plus 1/4 cup extra liquid is likely too much for one cup of flour. My rule of thumb is one egg per 100g flour (that's the "cheap" version from the "poorer" regions that requires a bit extra liquid, more on this later). One cup of flour is about 120 g, so I would guestimate 5/6 of a cup. But you can wing it a bit. 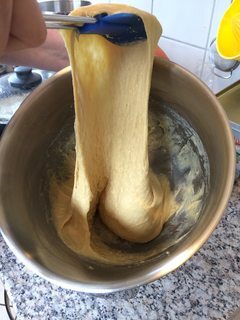 Use little liquid to thin the batter a bit, it should be still rather stiff and if you lift it with a spoon stretch a lot, not simply flow down. For your "Spätzehobel" (the grater-type thingy) you might have to thin a tiny bit more, just enough to cause gravity to let the batter form thick drop-like "blobs" underneath. If it flows, it's too much. Ditch the milk, use water and use it only to adjust the consistency. I see no benefit and admittedly it's a regional thing, but (and like so many things it's a cultural question) as a purist it's flour, eggs, salt. Nothing else. Off the cuff 1/4 c sounds reasonable, but follow the instructions above. You can also increase the egg amount and omit the water entirely. Bring a pot of salted water to a roling boil, just like you would for pasta. Use your "Spätzleshobel" (-> "Knöpfle"1 / "buttons") or a potato ricer (-> (long) "Spätzle" / noodles) to form your Spätzle right into the water. Do not put more than one "tool filling" in the pot at a time, work in batches. They will sink to the bottom of the pot. A quick stir can loosen those that may have stuck to the bottom. 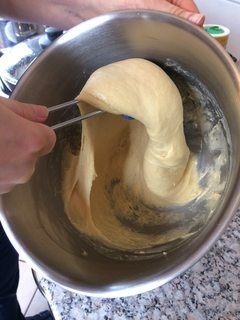 Once they float, take them out or leave them in the pot for another minute or two, depending on the "stiffness" of your dough. With your "Spätzlehobel" it's probably best to take them out as soon as they float to the top. Place them in a colander to drain. Repeat with the next portion. Left: not yet done, right: ready to take out. 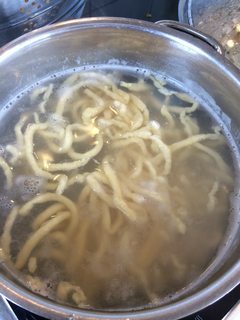 When you have cooked all your Spätzle, either pour the hot water over all Spätzle or return all noodles back into the pot (give a quick stir to loosen) and drain together. There are regional differences on what qualifies as "Spätzle". Some will only accept the long noodles as such and call the round blobs "Knöpfle" ("Buttons"), other regions have mainly the round variety and call them "Spätzle". For your "Kässpätzle" which hails from the Allgäu, the latter is the case. I use 2 eggs and 2 tbs milk for my spaetzle recipe (with the 1 cup of flour and 3/4 tsp salt). And a rolling boil, cooking for 2 - 3 minutes until all of the noodles are floating at the top... I also dump the batter on a cutting board and with a large knife I slice lengths of dough into boiling water. Not the answer you're looking for? Browse other questions tagged pasta noodles egg-noodles or ask your own question. 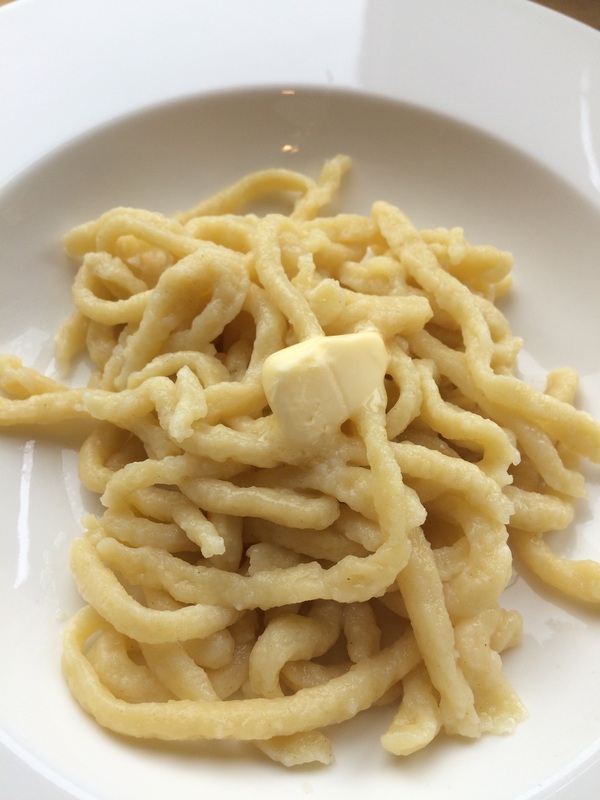 What is Spaetzle? How is it cooked? Can I cook pasta without heating it up… ever? Do I have to change the cooking time when I cook homemade noodles?